Pumped up by the fact that I really and truly finished something (and also by your kind comments -- thanks again to all! ), I got the baby sweater rolling anew. It's Pumpkin from Pipsqueaks, which I've knit for two other babies. No points for originality on this one. But I love the pattern, obviously. I did both sleeves lickety-split -- no real Sleeve Hell when you're knitting for a newborn -- and am now about one-fourth of the way through the hood. I'm using the Cotton Patine I bought a year ago for a top for myself. It's a somewhat sophisticated shade of blue; I'll sew a goofy duck on it or something, maybe. Or not. Clark's birthday will, God willing, predate the baby's arrival by a month and a half...does this mean I'm working hard to get his vest finished, as he has plaintively requested? Poor guy. He's already total chopped liver next to the baby! Pattern: I saw a hat in this shape with a rolled brim and ribbing at Knitter's Niche two years ago. The star is duplicately stitched from the chart on p. 59 of Pipsqueaks by Kim Hargreaves. Notes: My hope it that it'll fit well enough that the kid can wear it home from the hospital. 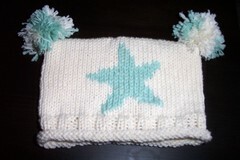 I made my first foray into duplicate stitch on a quick little hat for the baby. It started out as my first foray into intarsia, but that didn't last long. Longer than was pleasant, but still not very long. Maybe another time. I have to make and attach a second pompon, then I'll get a photo up. They made their debut at girlreaction a week ago, ahem, but they seem to be settling into their new digs well, waiting patiently for the Arrival. Thank you, Carolyn! We also love the Seussblocks. There's some knitting happening in this house, too, though not as much as I'd like. The Baby Ull sock is coming along for Clark. I need to kick-start that vest again, or I'm going to miss his birthday in mid-February. There's also a sweater for the baby from Kim Hargreaves' Pipsqueaks that's been languishing. That won't do! Hope your projects are flying off the needles like the snow swirling around Chicago on Saturday! Hey, I think I should be able to make the next KIP! Yay! Assuming the weather doesn't intervene again, that is. I had no idea how many times I would hear the phrase "Don't fall" in my status as a VPL (Visibly Pregnant Lady). I know it's just because people care, but do they think I'm toying with the idea of taking a fall, just for fun, and their chiding will dissuade me? Just one of those mysteries. 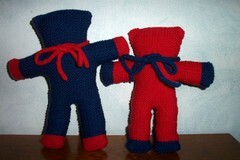 I began a pair of socks for Clark in Baby Ull. It's a nice break from his vest, and, since the socks are for him, I don't feel quite as guilty. Thanks for the backup on the oranges-in-the-stocking question! Growing up, I thought I was the only one whose families had this tradition, so you guys made my Christmas even merrier! Hope all had a great holiday and New Year's. The left front of the vest is almost done. Screamed through much of it, then hit a wall. But Clark's birthday is Feb. 12, and the vest will be finished by then if it kills me! Speaking of killing me, it's killing me that I probably won't make it to KIP again tonight. I am really bummed. The snow is not helping my mobility, plus I'm teaching again, which cuts into nap time, and I'm already pretty beat. Maybe I'll rally this afternoon, but if not, it'll really stink. Boo, hiss.